Christmas pudding recipes go hand in hand with Christmas. At our house, Christmas dinner is always concluded with a sensational Christmas pudding, steaming hot and smothered in a rich, sweet sauce. It has been our family's Christmas tradition for generations, and it's most delicious when homemade using traditional, old fashioned recipes. If you've never tasted an authentic plum pudding, you owe it to yourself to try one. You'll love it. Christmas puddings also display a rich religious symbolism (all described below) that will help to make the holiday more significant and meaningful for your family. Ingredients: 1-1/2 lb of raisins, 1/2 lb of currants, 1/2 lb of mixed peel, 3/4 lb of bread crumbs, 3/4 lb of suet, 8 eggs, 1 wineglassful of brandy. Mode: Stone and cut the raisins in halves, but do not chop them; wash, pick, and dry the currants, and mince the suet finely; cut the candied peel into thin slices, and grate down the bread into fine crumbs. When all these dry ingredients are prepared, mix them well together; then moisten the mixture with the eggs, which should be well beaten, and the brandy; stir well, that everything may be very thoroughly blended, and press the pudding into a buttered mold; tie it down tightly with a floured cloth, and boil for 5 or 6 hours. It may be boiled in a cloth without a mold, and will require the same time allowed for cooking. As Christmas pudding recipes are usually made a few days before they are required for table, when the pudding is taken out of the pot, hang it up immediately, and put a plate or saucer underneath to catch the water that may drain from it. The day it is to be eaten, plunge it into boiling water, and keep it boiling for at least 2 hours; then turn it out of the mold, and serve with brandy sauce. On Christmas day a sprig of holly is usually placed in the middle of the pudding, and about a wineglassful of brandy poured round it, which, at the moment of serving, is lighted, and the pudding thus brought to table encircled in flame. Preparation Time for Christmas Pudding Recipe: 5 or 6 hours the first time of boiling; 2 hours the day it is to be served. Sufficient for a quart mold for 7 or 8 persons. Seasonable on the 25th of December, and on various festive occasions till March. Note: Five or six of these puddings should be made at one time, as they will keep good for many weeks, and in cases where unexpected guests arrive, will be found an acceptable, and, as it only requires warming through, a quickly prepared dish. Molds of every shape and size are manufactured for these puddings. Soak one pound of stale bread in a pint of hot milk and let it stand and cool. When cold, add to it one-half pound of sugar and the yolks of eight eggs beaten to a cream, one pound of raisins, stoned and floured, one pound of Zante currants, washed and floured, a quarter of a pound of citron cut in slips and dredged with flour, one pound of beef suet, chopped fine and salted, one glass of wine, one glass of brandy, one nutmeg and a tablespoonful of mace, cinnamon, and cloves mixed; beat the whole well together and, as the last thing, add the whites of the eight eggs, beaten to a stiff froth; pour into a cloth, previously scalded and dredged with flour, tie it firmly, leaving room for the pudding to swell and boil six hours. Serve with wine or brandy sauce. It is best to prepare the ingredients the day before and cover closely. Cream together a cupful of sugar and half a cupful of butter; when light and creamy, add the well-beaten yolks of four eggs. Stir into this one wineglass of wine or one of brandy, a pinch of salt, and one large cupful of hot cream or rich milk. Beat this mixture well; place it in a saucepan over the fire, stir it until it cooks sufficiently to thicken like cream. Be sure and not let it boil. Delicious! Two cupfuls of powdered sugar, half a cupful of butter, one wineglass of brandy, cinnamon and nutmeg, a teaspoonful of each. Warm the butter slightly and work it to a light cream with the sugar, then add the brandy and spices; beat it hard and set aside till wanted. Should be put into a mold to look nicely and serve on a flat dish. 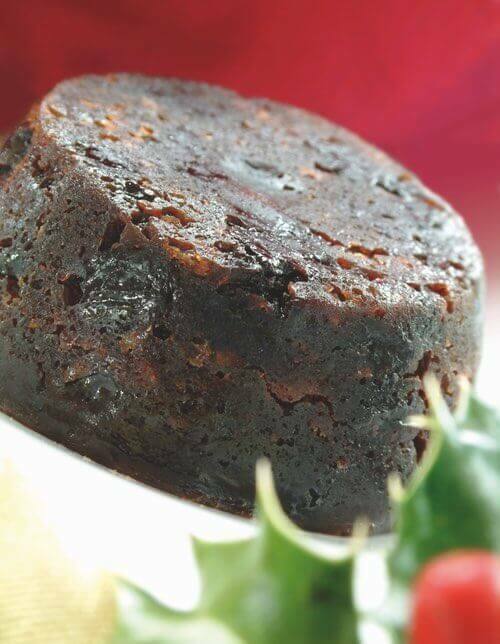 Here's an old fashioned Christmas pudding recipe that simply begs trying. This Christmas dessert recipe is not difficult to make, but it does require chopping suet and steaming for three hours. However, that shouldn't be a problem if you plan ahead. The pudding's citron, raisins, currants, and spices go well with a Christmas Dinner, and guests are sure to enjoy it. I'd suggest making a pudding ahead of time to test it, though. Sometimes, making the old time dessert recipes requires a bit of practice if we're not used to cooking. One cup milk, 2 eggs, 1 cup molasses, 1/2 teaspoonful nutmeg, 1/2 teaspoonful salt, 2 teaspoonfuls baking powder, 1 cup bread crumbs, 1/2 cup corn meal, 1 cup chopped beef suet, 1/4 cup finely minced citron, 1 cup seeded raisins, 1/2 cup currants. Flour to make a stiff batter. Steam fully three hours, turn from the mold, strew chopped almonds over top. Serve pudding hot with sauce for which recipe is given. Aunt Sarah invariably served this pudding on Thanksgiving Day, and all preferred it to old fashioned "English Plum Pudding." Cream together 1 cup of pulverized sugar, scant 1/2 cup of butter, beat whites of 2 eggs in, one at a time, and one teaspoonful of lemon flavoring; stand on ice a short time before serving. Serve sauce very cold. Carrot pudding smothered with hot butterscotch sauce was always a family favorite at Christmas time and on special holiday occasions. 1 cup each of sugar, raisins, currants, suet, grated carrots, and grated potato; 1/2 teaspoon salt, 1 teaspoon soda, 1-1/2 cups flour. Dissolve soda in a little cold water. Mix all ingredients, turn into a buttered mold, cover and steam. It will take about three hours of steaming for a large mold and one hour for individual molds. Test as you would cake to tell when done. 1-1/2 tablespoons butter, 4 teaspoons cornstarch, 1/4 teaspoon salt, 1-1/2 cups brown sugar, 1 cup boiling water, 1 teaspoon vanilla. Melt the butter, add cornstarch; blend thoroughly. Add salt, sugar and boiling water. Boil for three or four minutes to be sure there is no taste of raw starch. Remove from the fire, add vanilla. Chop the figs and mix with breadcrumbs. Brown the almonds or walnuts. Mix with remaining ingredients. Put the mixture into a greased pot and steam 2-1/2 hours in a larger pot, or bake in a 325°F oven for about 1 hour. You can add soft grapefruit peel for a flavor variation. Serve warm with a brandy and cream sauce, or whipped cream. Half a pound of breadcrumbs, six ounces of finely chopped suet, six tablespoonfuls of orange marmalade, two eggs, juice of one lemon, three ounces of candied orange peel, and half a cupful of milk. Mix the breadcrumbs with the suet, add the strained juice of the lemon, the marmalade, the milk, the eggs well beaten, and the peel cut into small pieces. Steam in a buttered mold for three hours. His Majesty King George V and the royal family enjoyed an Empire Christmas Pudding made by the royal chef on Christmas Day at Sandringham, 1927. 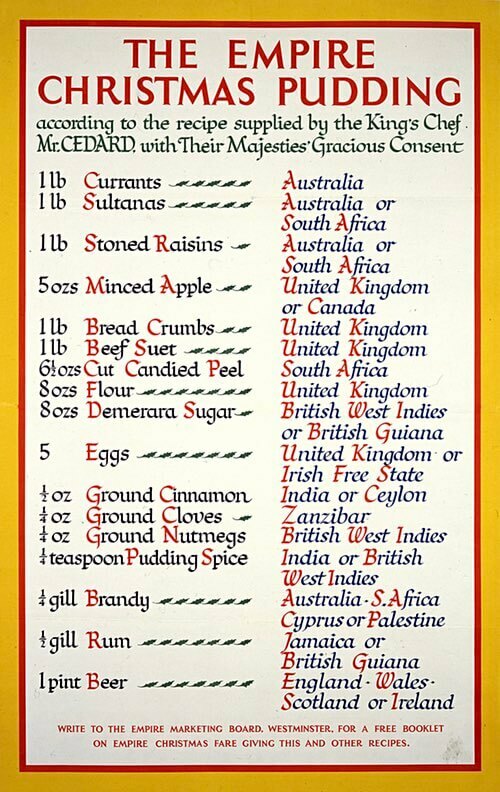 The special Christmas pudding recipe called for ingredients from empire countries, and it was distributed by the Empire Marketing Board to members of the public throughout the British Empire, so they could join the King in eating a patriotic pudding at Christmas time. The traditional English Christmas pudding recipe is said to contain thirteen ingredients to represent Jesus and His twelve apostles. What's more, the pudding is made on "Stir-up Sunday" which is the twenty-fifth Sunday after Trinity, the Sunday next before Advent, when each family member takes his or her turn stirring the pudding mixture from east to west to illustrate the journey of the Magi as they followed the Star. And the pudding must be stirred with a spoon made of wood in remembrance that the Christ Child lay in a simple wooden manger. 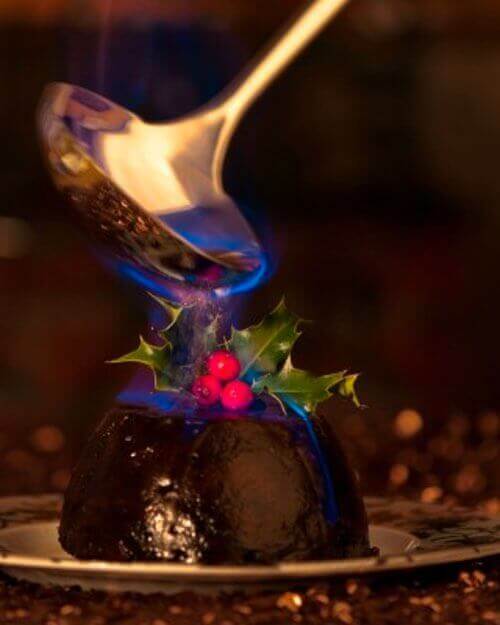 When served, the pudding's traditional sprig of holly garnish represents His Crown of Thorns and healing, and the flaming of the brandy symbolizes the Passion of the Christ. Once the Christmas pudding recipe is made, each family develops their own tradition surrounding the serving of the pudding on Christmas day. Why not start your own family tradition? 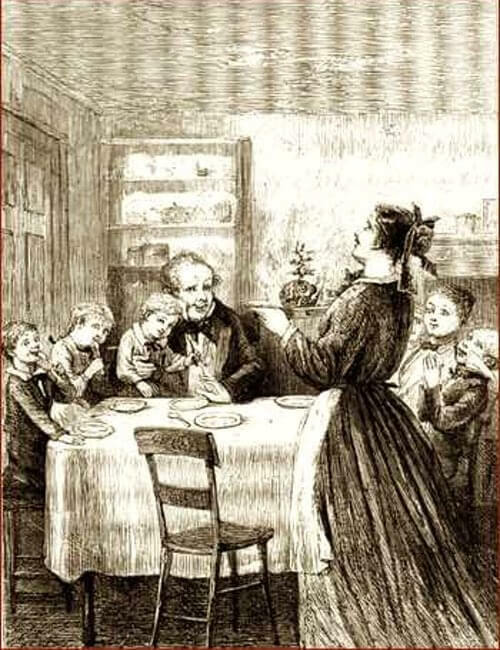 Mrs. Cratchit left the room alone — too nervous to bear witnesses — to take the pudding up and bring it in. Suppose it should not be done enough! Suppose it should break in turning out! Suppose somebody should have got over the wall of the backyard, and stolen it, while they were merry with the goose — a supposition at which the two young Cratchits became livid! All sorts of horrors were supposed. Hallo! A great deal of steam! The pudding was out of the copper. A smell like a washing-day! That was the cloth. A smell like an eating-house and a pastry-cook's next door to each other, with a laundress's next door to that! That was the pudding! In half a minute Mrs. Cratchit entered — flushed, but smiling proudly — with the pudding, like a speckled cannonball, so hard and firm, blazing in half of half-a-quartern of ignited brandy, and bedight with Christmas holly stuck into the top. Oh, a wonderful pudding! Bob Cratchit said, and calmly too, that he regarded it as the greatest success achieved by Mrs. Cratchit since their marriage. Mrs. Cratchit said that now the weight was off her mind, she would confess she had had her doubts about the quantity of flour. Everybody had something to say about it, but nobody said or thought it was at all a small pudding for a large family. It would have been flat heresy to do so. Any Cratchit would have blushed to hint at such a thing. Enjoy trying the original Christmas pudding recipes. The festive plum puddings are sure to be a big hit with your guests. Although these puddings call for a longer cooking time than other puddings, they are still easy to make, and their delicious taste more than make up for the extra time spent. And after all, it is Christmas. Have you heard about one of the more unusual Christmas puddings? A 19th-century sailor's English Plum Pudding Recipe is said to have saved an English sea captain's ship from certain destruction. Add a lump of charity — or two. Strain off all of poverty's distress. Season it with goodwill toward every man. Sweeten with a look from loving eyes. And serve it with the song of Christmas bells.